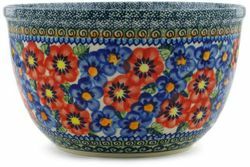 This medium sized Polish Pottery mixing bowl is ideal for mixing cookie dough batter thanks to its high rim. This mixing bowl works for salads, rice, pasta salad or any other side serving. These handmade stoneware bowls are heavyweight, beautifully colored, easy to use and to clean. Just sitting on a shelf our Polish Pottery mixing bowl is a beautiful accent to the kitchen.